The inaugural STEM Week Awards were given out yesterday, celebrating the achievements of 14 high and middle schools in science, technology, engineering and math (STEM). For the first time, diverse fields like VEX Robotics, FIRST Robotics, Science Olympiad, the Hawai‘i State Science & Engineering Fair, and CyberPatriot were recognized in a single awards ceremony. 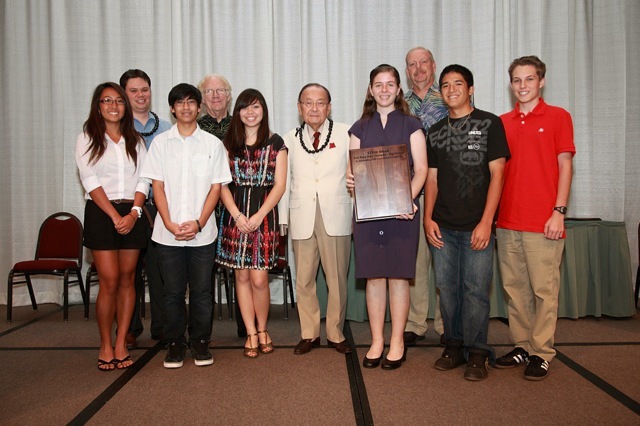 In his keynote address, Senator Daniel K. Inouye recognized the importance of STEM and its contribution to the competitiveness of Hawaii’s students. He reflected on his humble public school upbringing and how, only in America, he could fight the stereotype of a Japanese-American during WWII to achieve his current position as the President pro tempore of the Senate. On stage to hand out awards with Sen. Inouye were Neal Atebara, Chairman of the Board of the Hawai‘i Academy of Science (HAS), HAS President Kerry Kakazu, Robbie Alm, Executive Vice President of Hawaiian Electric Company, and Morgan Kapololu, Verizon Retail Manager. The inaugural STEM Week Awards also featured the first Daniel K. Inouye Award for Commitment to STEM Education, which went to Hawaiian Electric Company. The award is given to an individual or organization that demonstrated leadership in Hawaii’s STEM educational initiatives by ensuring continued access to STEM programs statewide. The STEM Week program also featured an Industry Exposition and Job Fair that gave local businesses and organizations the opportunity to showcase their technology and services to students, educators, and job seekers. For more information on STEM Week, visit STEMWeekHawaii.org.